I’ll start this off by putting it plainly: I am an Adidas fan. 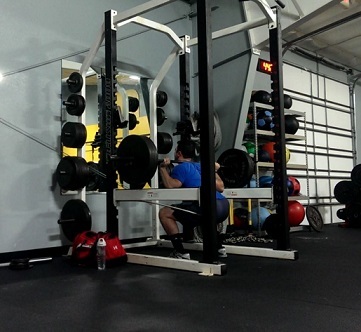 I have never had a bad experience with their products and the Powerlift 2.0 is no exception to that. 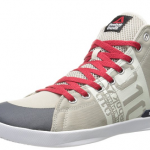 These are light weight and have the wide, raised base you would expect from a lifting shoe. The construction is great, and even though the gym is not a fashion contest, they offer a ton of color options that look great. 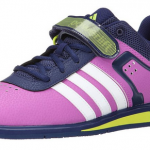 Most weightlifting shoes don’t offer more than two choices when it comes to color. The strap makes for a tight, secure feel when you’re going into a lift, because your foot is not moving at all. The distinct heel as shown in the side profile makes a large difference compared to a non-lifting shoe, because it is designed to give you leverage to push from. 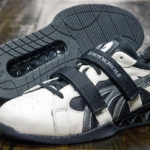 The build quality is superb as you would expect from a name brand and very light in comparison to other lifting shoes that are on the heavier side of the spectrum. 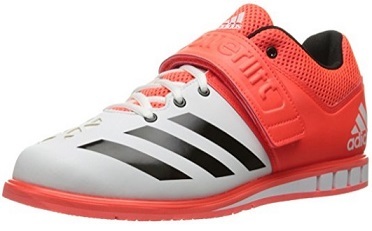 The Adidas Powerlift 2.0 heel height is .6″ which is a great sweet spot in my opinion. The only shoes that tend to have larger heels are the ones for olympic weightlifting. I like these so much because they don’t feel awkward to deadlift in and still help form on squatting immensely. If your ankle mobility is lacking you should have no issues using these shoes as the heel height is great. The materials that adidas used for this shoe are lightweight and quality. I’ve had mine for years, and they are my go-to lifting shoe with very minimal signs of wear. Plus, as you can tell from the pics they look great! I know some people probably could care less what their lifting shoe looks like, but I like having a little bit of style. And these provide plenty! One thing to be aware of is the sizing. From what I have been reading on other people’s experiences with them, some people have issues if they have wide feet, so ordering a half size up can alleviate that issue. My foot is a little wide, but I have no problems with them. The strap will make up for any negligible difference if the shoe is a little bit on the bigger side. The flat sole can take some getting used to if you’ve never worn a lifting shoe before. However, they do get a little bit more flexible once the shoes have some time to get broken in that is not much of an issue. I usually only wear lifting shoes specifically for leg day at the gym and nothing else. I would advise against wearing them outside of the gym (EVEN THOUGH THEY LOOK SO GOOD), because with all lifting shoes they are very specialized for what they do: giving support on a flat surface. 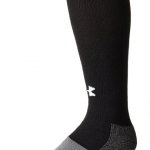 They won’t support your foot adequately walking over uneven ground, and it will wear the heel down. There’s always normal Adidas shoes for that! Proper maintenance of any lifting shoe will make it last much longer. 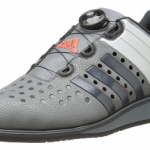 The Adidas Powerlift 2.0 are stylish, functional, and affordable. Plus you have the brand recognition so you can have confidence that you’ll get a quality product. They have been making lifting shoes for YEARS. I always feel like I’m taking a gamble when I shop if I don’t go with a recognizable brand with a proven reputation. 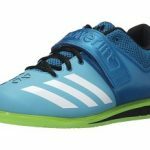 If you’re looking for an entry level shoe or heck, even intermediate shoe for weight lifting I highly recommend them. 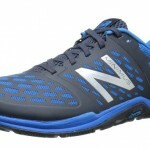 You will get more bang for your buck than possibly any other shoe on the market for lifting. The amount of quality you get is just not matched by any other shoe company on the market in my opinion in this price range. 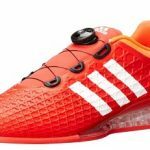 Since I wrote this article, Adidas released the Powerlift 3, which you can check out my more in-depth review of by clicking here. But I’ll talk about them some here too, because it’s the direct successor to the awesome Powerlift 2s! Overall, the 3rd version feels more like a stylistic facelift than anything else. The shoe’s overall design is largely unchanged, which is a good thing. I feel like Adidas did an excellent job with the 2 that would be hard to top. Don’t fix what ain’t broken and all that. The 2s are still a great shoe, so if you see a good price on them you should still get them. That is unless you’re a fan of the new stylings on the 3s, which are very similar to some of Reebok’s CrossFit shoes in my opinion. I’ll be honest, I like to wear a lifting shoe that looks good, but the fundamentals that make a good shoe having nothing to do with its looks. The 3s keep everything that made the 2 good!